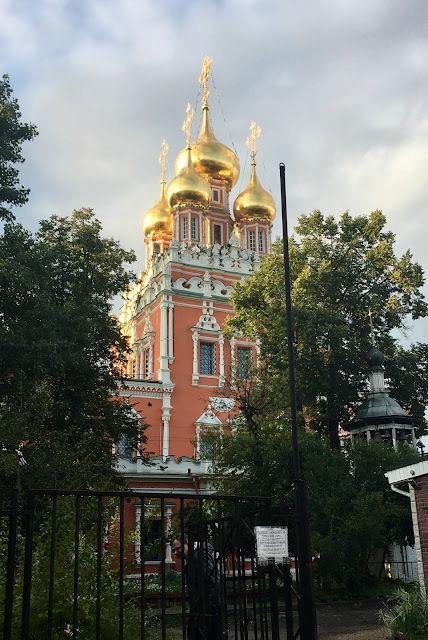 After last summer's amazing visit to Saint Petersburg (SPB), I was excited and intrigued to see Moscow. While I was overwhelmed by Moscow largeness, I felt that the difference between these two capitals (new Moscow and old SPB) have never been more striking. The root of these differences is, of course, the history of Russia. SPG was created and built by Peter the Great in early 1700s, as a window to Europe, to force a country isolated by Orthodox Christianity to join Europe’s road to Enlightenment. Meanwhile, Moscow which is almost 900 years old was and is now one of the pillars of Christian Orthodox tradition. The large old apartment in the heart of Moscow had many windows, with beautiful views and stories to tell. The Cathedral of Christ the Savior is the second church constructed on the site. The first one was built in the 19th century to commemorate the heroes and victory in the First Patriotic War (Napoleon’s invasion in Russia). That Church was destroyed by Stalinist regime in the 1930’s. An Olympic size swimming pool was built on the site in 1960’s. The idea to rebuild the church was one of the first post-Soviet projects and mostly was executed on charitable donation of Russian citizens and ex-pats. Moscow-city or the Moscow Business Center complex is another baby of post-Soviet era grand projects and obviously a symbol of new Moscow global ambitions, this time looking in the future. The ambitions are on-going and ignore current political bickering. The beatification and modernization of Moscow is a project of surreal proportion. The work is on-going 24 hours a day, seven days a week. The new sidewalks are paved with thick granite tiles, replacing the old asphalt sidewalks over large areas in the city center, with dozens of people working on each site. It is difficult to imagine the cost of this project, but it definitely provides a lot of working class jobs. The glorious 70th. These New Arbat buildings looked magnificent to me when I was 18 years old; I had never seen modern buildings looking so big and grand. It was also a clever design idea to shape these buildings like open books. Obviously, the grandeur and magnificence didn’t last as with most construction of this period. These buildings are signs of the time and they are going through renovation efforts to make the best of it. The damage is particularly depressing when you see the Old Arbat neighborhood and imagine what streets were demolished to build the highway and these modern cheap monstrosities. In addition to amazing food stands, the market was surrounded by eateries with amazing looks and smells. Every cuisine was represented: Georgian, Uzbek, Chinese, Thai and Vietnamese. At 11:00 am there was already a line to the Pho stand. We bought Uzbek samsa, which were still hot and Patrick finally tried real Russian kvas. This ancient, lightly fermented drink is impossible to understand when you buy it in the United States in plastic bottles. The real drink is slightly bubbly, has lovely flavor and is very refreshing. To get to the market we took the metro to station Polyanka (meadow). If you want to know how a perfect metro system should work, you must visit Moscow and use the metro. A weekly pass for all public transportation is less than $14. If you are in the middle of the train and exit to the platform, by the time you get to the end of station platform the next train has arrived. You are connected to free Wi-Fi at all times. It was a consistent experience throughout entire week. The only time we had to wait for about 3 min was after 11 pm. The metro first open in mid 1930’s and became a signature Moscow project. It was built to last and works like I never seen in any other metropolis. All stations have different design and older stations have imposing Soviet imagery, while modern stations looking very slick. Nothing helps more to appreciate the country or a city than having enlightened friends which know the place well and who are generous enough to share their knowledge with you. My old friends took us to several lovely excursions, including ancient city of Vladimir. It was the taste of Russia outside Moscow - old, vast, beautiful and spiritual in traditional religious way. The cloister setup by Elizaveta Fedorovna, member of Tzar’s family with tragic personal story of sacrifice and devotion. The church of remarkable beauty designed and built according to her vision behind the gate of the cloister. There is more to Moscow than Kremlin! Soviet imagery is very important and imposing theme in Moscow. There was also a different character to public events. In SPB, as part of annual White Nights festival, the live classical music was performed in city parks and it was in perfect harmony with classical city architecture. Moscow too was filled with music, but of another kind. On the Red Square nightly fireworks marked a week-long parade of military orchestras. While Moscow Central park (Park Gor’kogo) was immaculately taken care off, when we visited, the loudspeaker projected live bad performance of the worst sample of Soviet pop-music. That was obnoxious and disturbing. How to sum it up? What about the food, museums, theater, restaurants, pelmeni? It is impossible to tell it all. The experience leaves the visitor overwhelmed with the feeling that to know Moscow will take many more visits and loving Moscow may take a lifetime. Just ten days visit cannot cover the largeness, history, the speed of changes and layers of complexity and culture. As Russians will say -- Moscow is a city of contrasts. On the last day, after few days of miserable cold rain and grey skies, the weather suddenly turned sunny and warm. I told the driver who was taking us to airport how sad I was to leave the city on such a beautiful day. He said: “don’t worry, it’s not going to last.” So long Moscow!